The Case for Shareholder Yield - Epoch Investment Partners, Inc.
For investors, it has always been essential to understand the stock market’s past in order to gain insight into its future. At Epoch, we believe that such a perspective is particularly crucial in today’s investing environment. The determinants of future return are poised to undergo a dramatic change, and this change can only be understood by taking a long view of the financial markets. Specifically, our outlook is based around the concept of “shareholder yield.” We believe that, in coming years, shareholder yield will replace the P/E ratio as the most important metric available to investors, and will become one of the two dominant drivers of future equity returns. In addition to shareholder yield, the other key driver of market performance will be free cash flow applications for acquisitions and internal reinvestment projects. Let’s take a closer look at free cash flow and shareholder yield, and why the growing significance of these concepts will impact tomorrow’s investment paradigms. 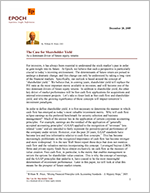 In order to define shareholder yield, it is first necessary to determine the manner in which cash flow has emerged as today’s most valuable investment metric. Why will cash flow eclipse earnings as the preferred benchmark for security selection and business management? Much of the answer lies in the application of certain corporate accounting principles. For example, earnings are the residual of the application of “generally accepted accounting principles” (GAAP) applied to the recognition of “revenues” less related “costs” and are intended to fairly represent the period-to-period performance of the company under review. However, over the past 20 years, GAAP standards have become less and less informative relative to cash flow concepts.1 This has become increasingly problematic as the recognized importance of cash flow has become stronger and more widespread. It is the rare Wall Street report these days that does not mention cash flow and the valuation metrics incorporating this concept. Leveraged buyout (LBO) firms and private equity funds focus almost exclusively on cash flow as the measure of value creation. Free cash flow, in particular, is the metric that enables management to review the options for shareholder value creation. This is why the concept of earnings, and the GAAP principles that underlie it, have ceased to be the most meaningful determinant of investment performance. Later in this paper, we will look at what this means for the prospect of future market returns. Every conceivable option for cash use falls into one of these five applications. Often, management will do a little of everything, but we see a distinction between the first three uses and the latter two. Unless the return on incremental capital is superior to the firm’s average return on capital, there is little point in pursuing option 4 (making acquisitions) or option 5 (reinvesting in the business beyond maintenance and capital expenditures.) Free cash flow should be returned to shareholders via one of the first three options. These first three possible uses of free cash flow (cash dividends, stock repurchases and debt reduction) are effectively dividends. Therefore, we refer to these three options collectively as “shareholder yield”. Let’s explore the ways in which these three uses of free cash flow can positively affect the return on a shareholder’s investment. First of all, the manner in which shareholder yield can be created through receipt of a cash dividend is fairly obvious. A stock buyback is also a clear method for value creation, so long as the stock buyback is not a device to make up for dilution from option issuances to management and others. Debt reduction also creates shareholder value, but the means by which this is achieved is slightly more subtle. To understand why paying down debt results in shareholder yield, it is helpful to consider the famous finance paper by Franco Modigliani and Merton Miller. These two Nobel laureates proved that a firm’s value is independent of how it is financed, provided that one ignores the tax effect of debt interest. If Modigliani and Miller are correct, then using free cash flow to repay debt results in a wealth transfer from the debtor to the shareholder. Since the value of the firm remains the same, shareholder wealth is increased as debt is reduced. Now that we have defined the specific importance of shareholder yield, it is time to look at the larger picture of how this concept will play into the future performance of the equity markets. To paraphrase the statement from the opening paragraph of this paper: how can we look to the history of the markets to better understand its future drivers? The information provided in Figures 1 and 2 will allow us to begin formulating an answer to this question. These graphs illustrate the compound annual growth rates of equities as measured by the S&P 500. In our analysis, there are only three drivers of return – dividend yield, earnings per share, and the price to earnings ratio. Figure 1 breaks down the contribution made by each driver of returns for rolling ten-year periods beginning in 1936 and ending in 2004. Figure 2 displays the same data, but in a decade-by-decade format. As the observer will note, there are seven and one half decades displayed. In analyzing these graphs, one can see that double digit returns occur when P/E ratios expand, and low to mid single digit returns occur when P/E multiples contract. In the periods of time when P/E multiples contract, earnings and dividends acquire greater explanatory power in determining returns, as those two factors are almost always positive over rolling ten-year periods. Indeed, in some cases, increases in dividend yield and earnings per share explain more than 100% of the ten-year gains in the stock market. Despite the consistent contribution of earnings and dividends, P/E volatility appears to have the largest overall impact on valuation over the decade-long periods under discussion. Therefore, it is important to take a closer look at what determines the composition and movement of P/E ratios. Over long periods of time, P/E ratios are largely determined by one factor: inflation. The financial variable most closely associated with inflation is the long-term interest rate. As we can see in Figure 3, P/E ratios are inversely correlated with interest rates – falling when rates rise, and rising when rates fall. It is our belief that the recent extended cycle of falling interest rates ended in June of 2003, and we have now entered a period of rising rates.3 For example, the ten-year U.S. Treasury touched 3.11% in June of 2003 and is now more than 130 basis points above that level. If one works under the reasonable assumption that, for the foreseeable future, interest rates are likely to remain flat or increase, then P/E ratios are likely to remain the same or decline. In other words, should overall equity returns remain positive, they will be driven by dividends and earnings, and not P/E. Our analysis of historical market drivers in Figures 1 and 2 showed us why this should be the case. If we are to look at this situation in even greater detail, it can be shown that the outlook for equity returns is likely to be similar in scale to the growth in the overall economy plus dividend yield. This idea is supported by the fact that there is a strong correlation between nominal GNP growth and earnings gains. If we assume that nominal GNP growth will approximate 6%, and if we add the current 2% yield of the S&P 500 to that number, then the expected return for the U.S stock market will be around 8%. If interest rates rise, causing P/E ratios to fall, this 8% will be reduced. So what does all of this mean for the investor, particularly in light of our earlier discussion about shareholder yield? If we are likely to live in a world where multi-year equity returns average 6-8% rather than the 18% of the 1980-2000 era, shareholder yield (cash dividends, stock repurchases and debt reduction) will dominate as a driver of equity returns. In this environment, P/E ratios will cease to be the primary driver of positive returns. Armed with this knowledge, we believe that clear investment opportunities lie ahead. By assembling a diversified portfolio of securities that, in aggregate, possess a high cash dividend, a share buyback dividend and a net debt pay down of even a modest magnitude (0.5%) should allow investors to realize an attractive 6-8% yield. In creating this portfolio, securities will also be chosen based on the firms’ ability to generate annual operating earnings growth, which should translate into an expected growth rate of at least 3% over and above the initial 6-8% growth rate derived from shareholder yield. Hence, the investor will enjoy a prospective return expectation of 8% to 9% from this collection of securities which, due to its specific compositional characteristics, should be inherently less volatile than equities as a whole. In addition to its focus on shareholder yield, such a portfolio would be constructed utilizing several other important fundamentals. It must be global, thereby adding to its diversification benefits. Furthermore, no single security should contribute more than 2.5% to the portfolio’s expected shareholder yield, and no economic sector should exceed 15% of the portfolio’s total value. By adhering to these principles, we believe that investors can capture ongoing positive returns, even should interest rates rise and P/E ratios fall. The investment team at Epoch has been watching the market for years. We have seen trends come and go, and we have gained an understanding of what drivers are at the core of past, present and future equity returns. Our analysis of the market has shown us that shareholder yield will emerge as a dominant driver of future returns, and we are focused on ways to help our clients capitalize on this emerging investment opportunity. 1William W. Priest, “Mixing Financial Principles with Accounting Standards – A Slippery Slope,” 2005. 2Arzac, Enrique R., Valuation for Mergers, Buyouts, and Restructuring, Hoboken, NJ: John Wiley & Sons, 2005. 3William W. Priest, “3-11, A Rate, Not a Date,” 2004.